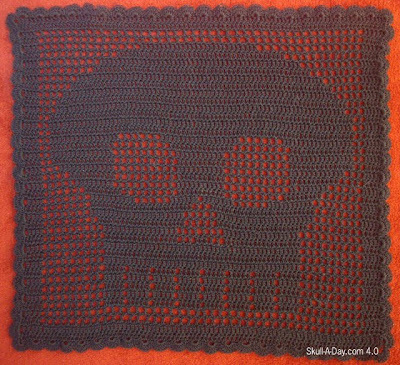 One of my favorite crafts to do while doing other things is crocheting, so I've made a crocheted skull. This one is oddly inspired by my late paternal grandmother who used to crochet fine cloth using the same technique, but with sewing thread. Because of her, filet crochet was the 1st technique that I did for a large project. I made this using a crochet technique called "filet crochet" that is a series of open and closed squares to create an image. I used a crochet thread and a very tiny hook to make this, so it is very light weight and delicate. If you would like to know how to make this project, just follow the tutorial. 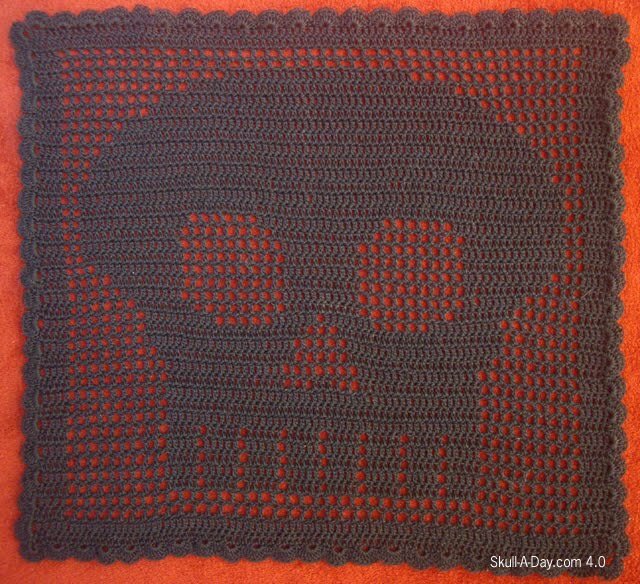 I have made a filet crochet skull scarf, that I wear every winter. You can see a picture of it in my old Ides of Skull Fanatic post. You can also take a peek at some other old skull art that I made. Absolutely gorgeous! I need one of those for my house! I might make you one then...maybe as a random surprise. Excellent work! My stepmom does a lot of crocheting so I will definitely share this with her. This looks like it could have started life as a doodle, before you got the crochet needle out. Very impressive. Tatman, feel free to. Maybe she will make one for you. DD - The nice thing about filet crochet is that could could take your doodles, make them into a grid pattern, and then crochet the piece according to the grid. It's really easy to make once you have your pattern...well it's a bit tedious to make, because if you lose your place in your pattern and mess up, you have to pull the thread (or yarn) back to the place that was correct. But, it's all worth it in the end when you end up with a great piece. I love this!! Thanks for the tutorial. I might attempt it. That's definitely a random surprise I would enjoy Abby!